While soul searching, M'k'n'zy made the decision to enter Starfleet, and entering the Academy in 2354. After soon finding that his native name was hard for most humans to pronounce, he changed it to Mackenzie Calhoun. His passage through the Academy was not without friction. He was considered by some to be a troublemaker, but others believed his forthrightness and integrity made him one of the most promising cadets to come out of the Academy in some time.While there, he met fellow cadet, Elizabeth Paula Shelby, and the two later had a tempestuous relationship that lasted for three years. They even were engaged for a time. Calhoun contended that he ended the relationship, but Shelby disagreed. After leaving the Academy in 2358, Ensign Calhoun was assigned to various starships where he acquired skills in every department. Rather than specialize, Calhoun decided to become good at all ship systems - always with his sights set on the center seat. During this time, he gained a reputation for tenacity and frankness. Calhoun was well liked by his peers but did not usually engender himself with those in the higher echelons of Starfleet Command. 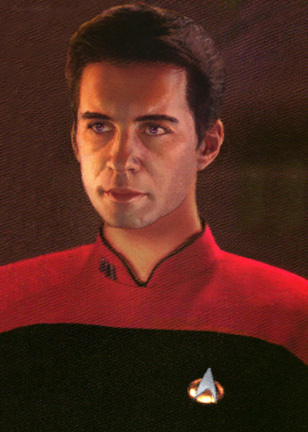 In 2368, Mackenzie Calhoun was promoted to the rank of Commander and shortly thereafter was assigned to the Excelsior-class U.S.S. Grissom as the ship's First Officer. Some months later while on an important mission, the ship's captain went into a dangerous situation which resulted in tragedy. Executive Officer Calhoun had feared the worse beforehand, but was incapable of preventing the disaster. After the incident, Calhoun was brought up on charges and a court-martial was held. He was exonerated, but the whole situation prompted Calhoun to part company with Starfleet. Calhoun stormed out of Captain Jellico's office and resigned, telling him to go to hell. Shortly after his departure, Calhoun got himself in somewhat of a jam. Admiral Alynna Nechayev, one of those in Starfleet who recognized Calhoun's potential, intervened on his behalf. She was able to pull some strings to get him out of the trouble he was in. In return, Calhoun remained "in the field" as a clandestine deep cover operative. Officially he was on leave from Starfleet. From time to time Calhoun would be called upon to do "special jobs" for Admiral Nechayev. These were jobs that were important to the Federation, but which could not be done officially. This arrangement went on for some years. In late 2373, the Thallonian Empire collapsed and a meeting was held aboard the U.S.S. Enterprise-E to discuss how Starfleet should respond to the potentially volatile situation. Present at this Thallonian Summit were Captain Jean-Luc Picard, Commander William Riker, Admirals Nechayev and Jellico, former Thallonian prince Lord Si Cwan, Danteri Ambassador Ryjaan, and the 143-year-old Ambassador Spock. It was decided to send in a lone starship, the U.S.S. Excalibur, into the former Thallonian to render aid when necessary, to report back on the situation as it unfolded and to show the Federation flag in that unstable area. Over Admiral Jellico's objections, the command of the Excalibur was given to Captain Calhoun. Commander Shelby was very disappointed when she heard the news, since she coveted the captaincy of the Excalibur for herself. She went to see Calhoun on the Excalibur, and after some heated discussion Calhoun gave her the job of the ship's Executive Officer. Mackenzie Calhoun is an independent, passionate, instinctive, wise and plain-speaking individual. He is a man of action, with a razor sharp mind and excellent reflexes. Those who have worked with him for any length of time, know him to be a maverick who prefers to make his own rules, disregarding regulations at every turn. When solving diplomatic or tactical problems, he often pushes the envelope, coming up with innovative and creative solutions that are not even close to the procedures prescribed by Starfleet regulations. Mackenzie prefers to operate independently, and he accedes to authority only when it suits him or is absolutely necessary. The term "born leader" is a great understatement when describing Calhoun's ability to instill loyalty in those serving under him. He, in turn, is extremely loyal to his friends and crew and he will go to great lengths to serve and protect them. Even when he was a young man, Mackenzie was tough and seasoned and wise beyond his years. Calhoun is fair-minded and is frank almost to a fault. He does not feel compelled to observe rules of decorum, and he never shrinks from stepping on toes when he needs to get something done. He has never been intimidated by admirals or kings, but he greatly respects those who are tops in their chosen fields. Like many captains, Calhoun maintains himself somewhat distant personally from his crew, relying on his executive officer to provide the thumb on the pulse of the crew. Captain Calhoun is an intuitive and instinctive tactician and strategist and he is a keen judge of character. His close friends sometimes call him "Mac." Captain Mackenzie Calhoun is the Commanding Officer (CO) of the U.S.S. Excalibur. As CO, Calhoun is responsible for seeing that all missions assigned to his ship are carried out. He is the chief representative of Starfleet Command to all visiting dignitaries and while on first-contact missions. At social functions aboard, the captain acts as the ship's host, and he presides at all ceremonies. Administratively, the captain is the final approval authority for all policy decisions aboard ship and has final approval for all promotions and transfers of crew personnel. The CO also must approve all official communiqué's sent from the ship. The Commanding Officer fights the ship in battle and sometimes delegates weapons release authority and maneuvering to the Tactical and Conn Officers. It is assumed that the CO is proficient at all jobs under his command and should be able to take over for almost anyone aboard ship (with exception of the ship's doctor and certain technology specialists). Most importantly, a ship captain is the leader of the crew and is an ideological figurehead and role model for junior officers aboard. The CO is the ultimate authority regarding the interpretation of orders, Starfleet regulations and directives, especially the applicability of the Prime Directive. The face used for Captain Calhoun on the covers of the New Frontier books belongs to a friend of cover artist Keith Birdsong. The model for Calhoun's appearance lives in Arizona and he is not an actor. The initial idea and most of the background of the New Frontier book series came from John Ordover, Senior Editor of Star Trek fiction at Pocket Books. Mr. Ordover gave author Peter David general guidelines for what he wanted the ship's captain to be like, but the final details and the fleshing out of the Calhoun character came from Peter David. There is a limited edition Captain Calhoun Action Figure made by Playmates Toys and available through the Official STAR TREK Communicator magazine. It is fully articulated and comes with the sword he used when fighting for Xenexian freedom. He is highly detailed right down to his purple eyes and the scar on his cheek. Available ONLY through pre-orders, the figure will ship in September 1998. It is very limited and may sell out at any time. The figure can be ordered from an order form found in the back of Book 6. The figure is an exclusive to STAR TREK Communicator and will not be available anywhere else.